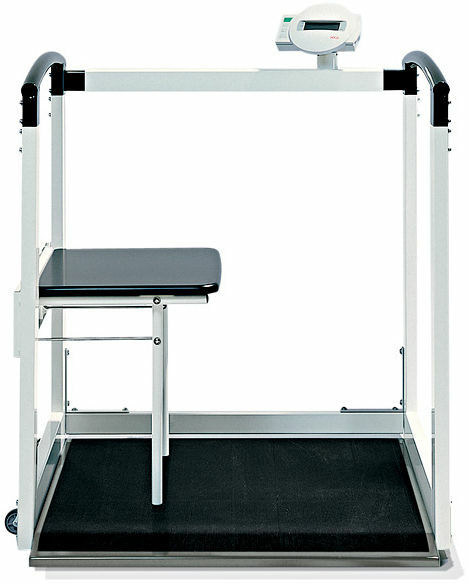 Facilitates safe weighing while standing, sitting or in wheelchair – without having to be converted: when standing the patient is supported by a stable handrail, when sitting by an integrated folding seat and in a wheelchair by a large platform (31 x 38") – the weight of the wheelchair is simply tared away by the pre-TARE function. Special attention has been given to making the scale easy to access, a stop barrier for the front wheels of the wheelchair is an additional safety feature. The weight is easy for patient and care giver to read from the swivelling display mounted at a convenient level, reliable net weight determination in spite of added weight with the TARE and pre-TARE functions. Practical HOLD function for showing the weight even after the patient has left the scale. Precise results due to the damping, safe stand due to non-slip rubber coating and railing, mobile with integrated transport castors. 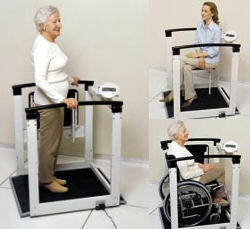 Weigh by standing, wheelchair or sitting on the integrated seat, 3 scales in 1! 31.5" x 33.5" x 1.8"
35.8" x 38" x 10.8"